And now, of course, where else to end this Red-Letter Day but with the "star" of the show. 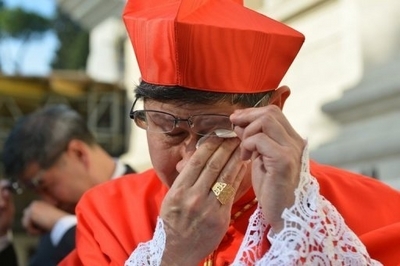 Even as the timing of another intake might've made for a surprise,it's fair to say this Consistory's safest bet was that, at some point, Chito Tagle would burst into tears. As the wider church has come to learn over recent months, that's a rather common occurrence. And right on the money, no sooner did the 55 year-old "golden child" of Manila kneel before Benedict XVI this morning to receive The Ultimate "Like" than the weeping commenced, prompting a moved Pope to cradle the new cardinal's face in his hands and offer a word of encouragement as, holding onto the armrests of the papal throne, a trembling Tagle lowered his head and broke down. Notably – yet perfectly in keeping with the unspoken "script" evident from this gathering's outset – the moment likewise seemed to spark B16's warmest expressions of the day. 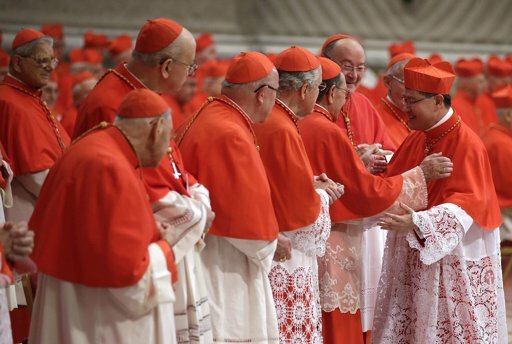 Installed in the capital just 11 months ago, the unexpectedly quick elevation of the Philippines' seventh native cardinal caps a meteoric year for the Washington-trained theologian, who had the even rarer privilege of receiving the red hat with both of his parents on-hand to witness the moment. Barely three months after Tagle's predecessor, Cardinal Gaudencio Rosales, "aged out" of a hypothetical Conclave on turning 80, the elevation of a new Filipino elector restores the lone vote for a Pope held by one of the world's most densely-Catholic countries, whose 75 million faithful comprise a larger group than its 67 million-member counterpart in the US. By contrast, with today's elevation of the Milwaukee-born Vatican "lifer" James Harvey, the Stateside church now returns to a bloc of 11 cardinal-electors. 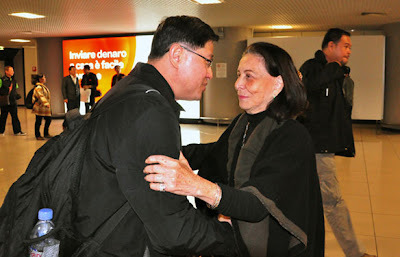 Touching down at Fiumicino on Wednesday clad in a windbreaker, a backpack strapped on and bottled water hanging out, it wouldn't be a surprise if at least a few untrained observers mistook the boyish cardinal-designate for a returning student-priest... if only the welcome from the Filipino ambassador to the Holy See (below) hadn't blown his cover. Like much else on all sides these days, the sheer existence of a College of Cardinals – to say nothing of its makeup and traditions – is enough to make a good chunk of the Catholic conversation foam at the mouth. Ask what a better substitute would be, though, and when you get as many differing answers as there are critics, any constructive discussion from there tends to fall by the wayside. Put simply, as the system's roots date back some 1,900 years – and any thoughts of outliving it prove less a commentary on the needs of the church than the state of one's ego – highlighting what's good with what is and encouraging its spread tends to be a much healthier use of time. And when a figure who, as a bishop, has declined the use of a car in favor of buses and his bike, does his pastoral rounds alone and has repeatedly called the church todivest itself of arrogance is brought into the Papal Senate, many of today's supposedly "knowledgable" or "enlightened" criticisms and claims suddenly ring rather hollow, and could be deemed as willfully blind or even disingenuous. Then again, since the temptation to talk more, listen less and look to the rest to testify stands as a towering danger for the church in an internet age, perhaps it was especially fitting that Rome's Man of the Hour – already Catholic new media's most popular prelate – counterintuitively used his talk at last month's Synod for the New Evangelization to press instead for an ecclesial rediscovery of "silence" and, soul by soul, a return to "a simpler witness to Jesus, meek and humble of heart." And to a big degree, he was right. While "it is good to know that thousands and thousands 'like' himon Facebook," the cleric – for purposes of context, pretty firmly a man of the center – mused that "few outside of the Philippine community understand why so many don't just like" the new cardinal, "but love him, or [know] just what an extraordinary man he really is. "I am not Filipino," he added, "but was able to experience [Tagle's] character as a truly GOOD shepherd in a very special way." "After finishing [a lengthy, high-profile assignment], I took a few months of sabbatical in the Philippines. A priest friend of mine arranged with then Bishop Chito to direct a thirty-day Ignatian retreat for me. I was the given a small room in a convent in Tagaytay, a resort town that is part of his former diocese of Imus, in Cavite [province]. For thirty days, this bishop with plenty else to do [Ed. Note: the Imus diocese numbers some 2.3 million Catholics] took an hour out of his day to come by the convent and visit with me, guiding me gently and assuredly towards a deeper and ever more rich experience of God's presence in my life. He also shared much of his own life with me. I was able to meet as much in him Jesus, the Good Shepherd, as in my own meditations on the various scripture passages he offered to me for prayer. Just one moment of grace among many: One evening, he invited me to join him and his seminarians for dinner at their nearby seminary, where he served as rector and bishop. What a lovely surprise when dinner was served to find the seminary staff, the cooks, the maintenance boys, the shepherds just in from the barn, all take their seats with their bishop and the seminarians for the meal together. No rank, no superiority or inferiority, no cleric versus laity, no rich versus poor, just one family enjoying a simple meal together. Besides being a fine theologian, a master of the internet and mass media, a very competent administrator, in a society filled with extraordinary corruption, Chito Tagle stands as one of the few public figures who is absolutely unbribable. And on top of that, he is authentically humble. 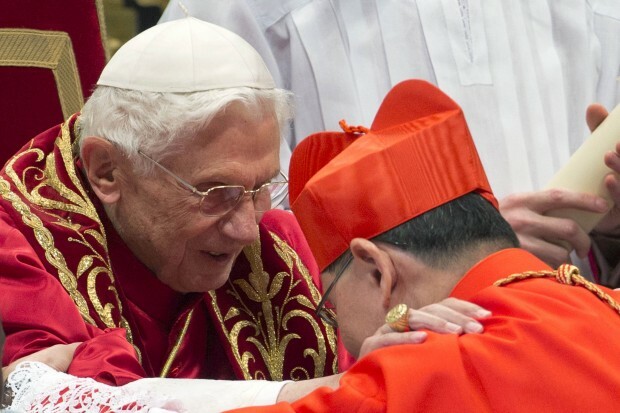 He is simply the smartest, holiest, most courageous, most sacrificial, most pastoral man, priest, bishop, archbishop… and now cardinal I have ever met anywhere. These are the reasons he is so popular in the Philippines and why he has so many "likes" on his Facebook page. This is why politicians and government officials, not to mention priests and seminarians, religious and laity, seek his counsel in their difficult moments. More than any single person in the Catholic Church today, this simple and loving shepherd gives me, by far, the most hope and joy. For him and those like him, today I give thanks...."
And especially on this Thanksgiving weekend, so should we all give thanks for all the many, many great lights among us... because, even for the high challenges and roiled scene of these times, what Church could ever ask for more than these? May the lot of us know the grace to be ever more like them – in truth, to be them – today, tomorrow, and always.